^ Noizr Official Youtube channel. "Interview: CHILDREN OF BODOM's Janne Wirman on Touring, New Album, and "Stranger Things" — Noizr". Retrieved 29 September 2017. ^ TotalRock Radio Official Youtube channel. "Children of Bodom interview Wacken 2018 — TotalRock Radio". Retrieved 20 August 2018. 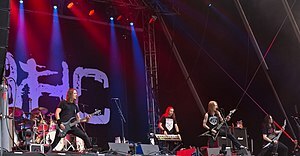 This page is based on the Wikipedia article Children of Bodom; it is used under the Creative Commons Attribution-ShareAlike 3.0 Unported License (CC-BY-SA). You may redistribute it, verbatim or modified, providing that you comply with the terms of the CC-BY-SA.